Today is the Reveal for July's selection of the Inspired by Reading Book Club! We read, "The Cookbook Collector" by Allegra Goodman. The general consensus was that everyone liked the book and many of members said that they would read other books by the author. I really enjoyed it and devoured it readily! The book is about two very different sisters who navigate their loves and livelihoods, and over the course of the novel, they discover their hidden, personal histories and confront the intricate patterns of destiny. At the center of the book is a rare cookbook collection and the mystery of its eccentric owner. Since the weather was so nice, I decided to have the meeting outside in our courtyard at Allegory Gallery. I set the table with tea lights, lit some incense (to repel the bugs), and arranged the flower pots. For the in-person meet-up, I made a cake that's mentioned in the book. I used the adapted recipe from The New Enchanted Broccoli Forest by Mollie Katzen for the Chocolate Honeycake. It was dense and super chocolatey. CLICK HERE for the recipe. I also made a peach cobbler. Although there's no mention of a cobbler, there is a very significant peach mentioned in the book. I took advantage of the fact that peaches are in season and whipped up a peach cobbler. I even served it with chardonnay! "Kistler Chardonnay" is mentioned in the book, but with a price tag ranging from $50 to $200 a bottle, I opted for significantly cheaper Clos du Bois instead. And without further ado... here's the REVEAL! Laurel Ross made this necklace. Part of the book deals with internet start-up companies and Laurel wanted to capture the "silicone valley romance" aspect. She found an old circuit board, drew out the shape and had her husband cut out the heart. She filed down the sharp soldier points and smoothed copper tape over the edges as a finishing touch. I think this is a very clever interpretation and she totally tapped into a big part of this book. The necklace has an edgy vibe. Laurel also made customized, stamped cards! She generously presented each of the attendees with a set of peach-themed cards. The layers are great and the colors are so fresh! Amy made this stunning necklace. 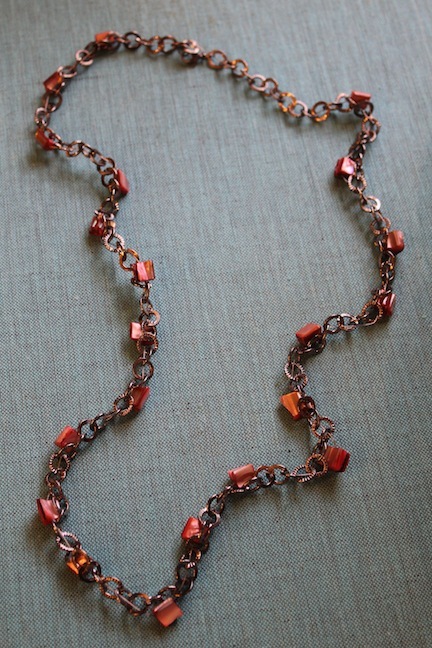 The necklace was created by weaving beading wire through the links of the gunmetal chain and periodically stringing beads. Amy said that she chose to use this particular technique to epitomize how all of the events in the book weave together. Even something seemingly random and mentioned offhandedly, comes back and plays a role. 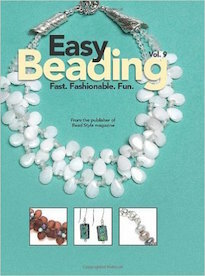 The mother of pearl wedge beads are supposed to represent peach slices. She did such a wonderful job! The piece is really stunning and is very wearable and elegant. 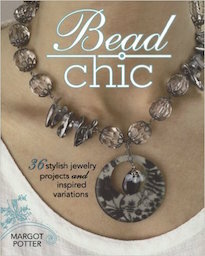 It has a nice weight and I like how the beads give the piece a pop of color and extra texture. This is Terri's piece. She found a lampwork glass bead on Etsy of a peach and created a wire-wrapped dangle. She strung the dangle on a length of leather. Here's a close-up of Terri's find. Her piece is simple, but she said that after she had the peach, it didn't need anything more. Sometimes simplicity is the best. It's a perfect example of how you don't have to spend hours and hours on a project to participate in the book club. Here is Terri sharing another find for a future project inspired by The Cookbook Collector. The piece is a carved stone pendant with a tree on it. She also had some luscious black recycled sari silk ribbon. I can't wait to see what she makes! This piece was made by Connie. 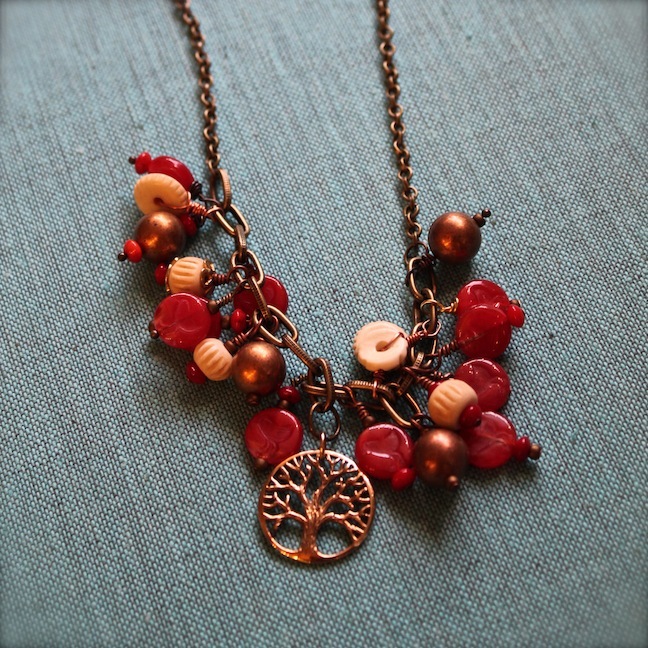 It has a tree pendant and is supposed to represent the family tree and alludes to one of the main character's tree activism. It's a lovely piece with a lot of movement and energy. The bright red marries perfectly with the reds and coppers, with pops of ivory to set it off. Even though Jeanne is going to be posting on her own blog, I couldn't help but snap a picture of her piece. It's really beautiful. She combined sterling silver chain, wire components, and larimar. Jeanne came all the way from Long Island to visit! I didn't realize this, but apparently we had met a few years ago when we did a show out that way. It was very exciting to reconnect! The focal is a piece designed by my family at Green Girl Studios! The Gertrude Stein quote on the back says, "Let me listen to me and not to them." To read more about her piece CLICK HERE. This is my piece! Actually, it's one of the two of them. I wasn't sure if I was going to like the piece when I working on it, so I decided to start another. By the end of it, I was quite pleased. It's eclectic and has all kinds of beads on it. I wanted to capture the vibe of the redwood forests and peaches. I used a quatrefoil link to pay tribute to the architect, Bernard Maybeck, who is mentioned frequently in the book. This is my second piece. I used a heart as the focal. The focal is a porcelain piece by Nancy Schindler. 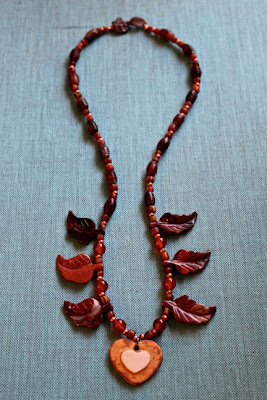 I paired the heart with carved stone leaves, agate barrels, Javanese glass, and copper rounds. 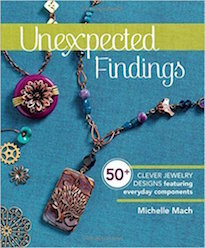 The clasp is made of shibuichi and is from my family at Green Girl Studios. I used the leaves to reference the tree activism and I used a heart because there are several love stories in the book. It was a really fantastic evening! Amy and Laurel picked up frozen yogurt from the local creamery and we paired it with the cake and cobbler. We sipped wine while fireflies danced around the table. 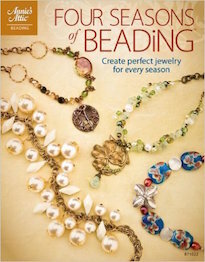 We talked about the book, beads, and the things we made. We shared stories about our lives and enjoyed each other's company. It was a really wonderful way to celebrate creativity and friendship. 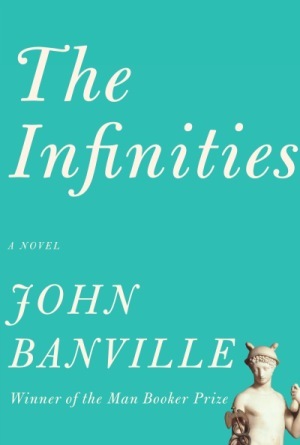 The next book for the book club is, "The Infinities" by John Banville. For this year's full list, CLICK HERE. The list for next year will be coming soon! The in-person meet up is scheduled for Tuesday, August 27th! The next blog hop is Wednesday, August 28th! If you're interested in keeping up with what we're doing, CLICK HERE to visit our Facebook group page. We also have a Pinterest board with supplemental inspiration. CLICK HERE to view that. Great news from the Cousin Corporation! 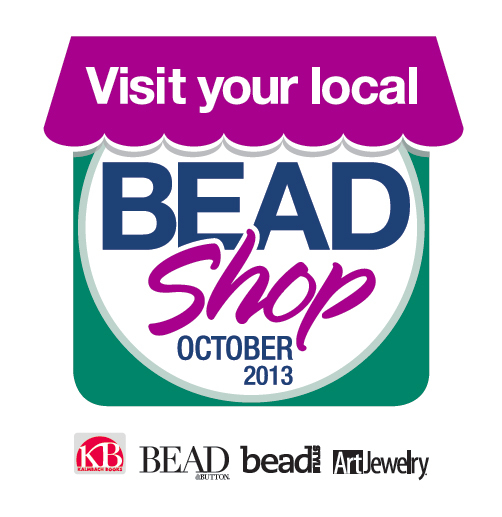 Five new jewelry making ambassadors have been announced! Catch up on a few new book reviews, one sweet and one artistic. Check out this week's featured designer of the week – Tres Jolie Designs by Sue – and the stunning necklace which caught Erin's eye! 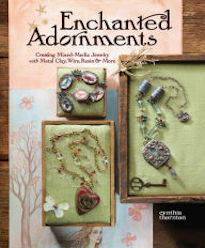 Cyndi shares all the finishing touches on her new mixed media necklace tutorial! Jean reviews Stitch Workshop, Herringbone Stitch, basic techniques, advanced results, and is thrilled to further acquaint herself with this fabulous stitch, also known as Ndebele! 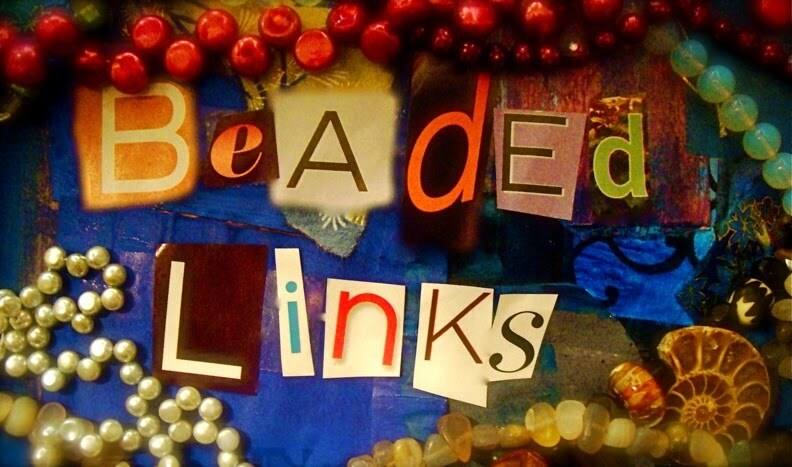 Using lovely pink beads, Andrew creates a fun, sparkly bracelet! 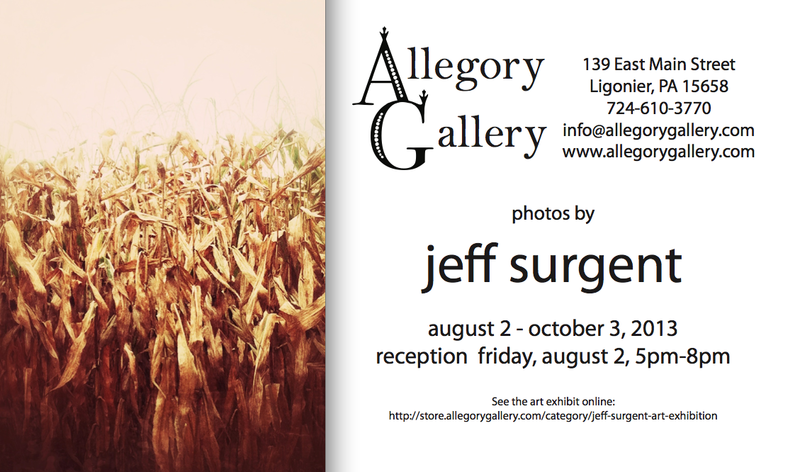 We're very excited for the opening of Jeff Surgent's new show at Allegory Gallery! It'll feature fourteen original photographs by this talented, local photographer. They will range in price from $60 to $145. The opening reception is Friday, August 2nd from 5PM to 8PM. If you're in the area, please do try and stop by! And if you can't stop in, you're in luck! The show is online! You can actually get an advanced look at the show by CLICKING HERE. A few days passed and I thought they'd take up permanent residence at the shop... that is, until... a customer snatched them up, saying how nice they'd be in a bracelet. I couldn't disagree. They would be nice in a bracelet. My first attempt, I used a very fine gauge of flexible beading wire to fit through the thin holes of the briolletes. It didn't make it down the street without breaking. I knew in my heart that it would. The test poundage was just too low and the bracelet gets a lot of action with all the movement. I had to redesign how I wanted it to look and create something that was more durable. I decided to sew each individual bead onto a piece of silk cording. 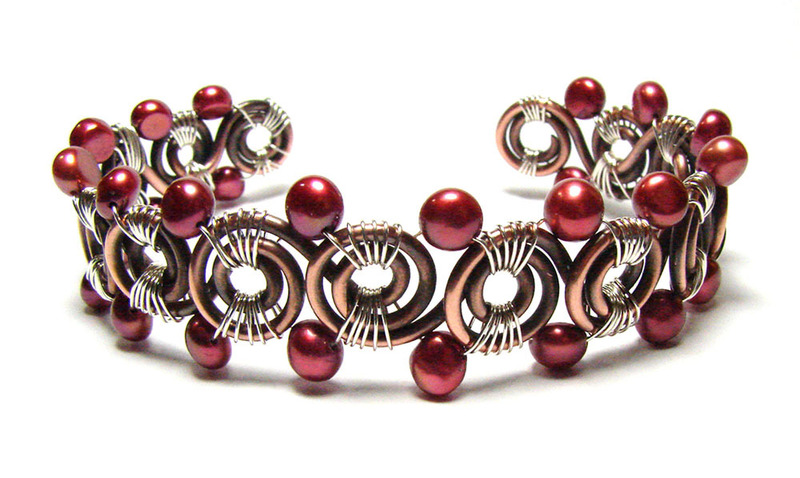 The "underbelly" of the bracelet was left unadorned to make it more comfortable to wear and keep it flexible. It took longer than just stringing them, but this should last a good long time. I'm really happy with the end result and hope the customer likes it too! I got in the mood to paint. 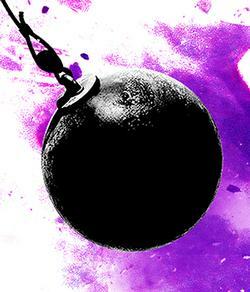 My fingers have been itching to do so after the Wrecking Ball Party. I was looking at some books on Picasso, Matisse and Modigliani earlier this week and thought I'd do a group of small-scale portraits in the Modernist style. They're about 1.5" wide and 2" tall. 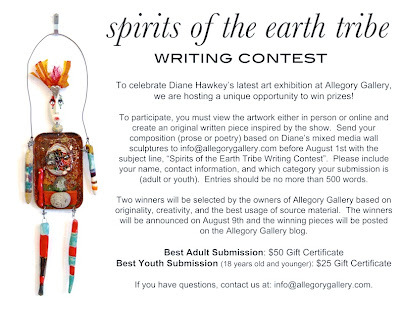 There's only one week left to enter the Spirits of the Earth Tribe Writing Contest. Celebrate Diane Hawkey's new show by getting inspired by her mixed-media sculptures and writing about them! There are two categories; participation is open to both adults and young writers. Winners will take home gift certificates that can be used in the shop! It has been a little over a week and I'm still thinking about Words in Process. The experience is lingering and has been on my mind. Christina Springer was sharing some of her work as the featured author. I'm reminded of the quote by Muhammed Ali... "float like a butterfly, sting like a bee." Christina's words are like that. They would rise up melodiously, pouring out like sweet lullabies and then suddenly... SMACK! She'd punctuate her pieces with raw emotion. The air around her was charged with energy that would crackle and pop. Her presence filled the room and we were all in her thrall. On more than one occasion, members of the audience couldn't help but exclaim, "Wow!" She also spoke frankly about thinking about "business of art and the art of business" and shared some of her own experiences traveling the world, performing art pieces and delivering poetry. It was a real pleasure. 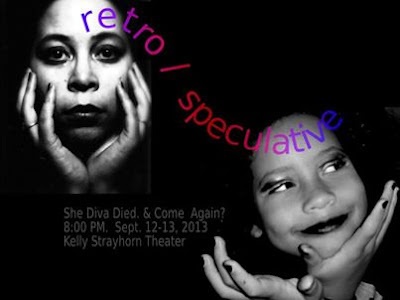 If you're in the Pittsburgh area, I strongly encourage you to attend her upcoming show at the Kelly Strayhorn Theater. Her work dives into what it means to be a woman, a mother, a person of color. It'll be an event not to be missed! CLICK HERE to check out her blog. Not that long ago, I was introduced to the plant called, teasel. It's a pretty purple flower that grows along the highways. It is a favorite of bees and butterflies. Don't try and pick it though. The stem is covered in sharp barbs and flowerets disguise a cone of thorns. They can also be quite invasive. One might want to write it off as a nuisance, but even the most prickly plant in the patch has its purpose. In the winter, the seeds provide a food supply for goldfinches. The dried heads can also be used to comb fibers, like wool. Some even say that their medicinal qualities can combat Lyme disease, act as an antibiotic, improve circulation and cure warts. The teasel is a plant that is a lesson in life. From far away an opportunity might seem perfect, but upon closer inspection, it can reveal hidden harms... even still, those little things that make it less than perfect in one light can be transformed into something useful in another. 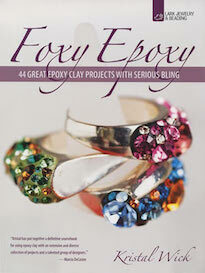 I'm really excited about a few of our upcoming classes at the NEW Allegory Gallery Annex! 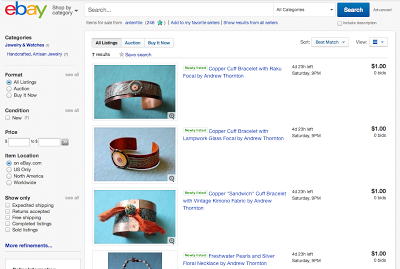 This weekend coming up is Maria Richmond's "Twist of the Wrist" class. She'll be teaching on Sunday, July 21st. 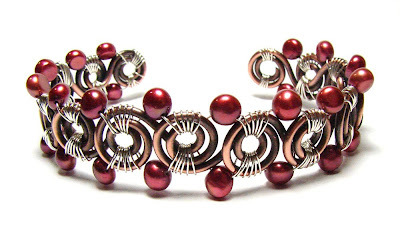 I love the spirals and how the accent beads make the cuff bracelet look really opulent and rich. To find out more and to register, CLICK HERE. 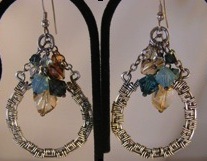 The following weekend is Jan Durkin's Woven Wire Earrings class! 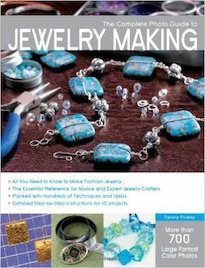 That class is Saturday, July 27th from 11Am to 4PM. The finished project is really elegant and has a lot of movement and energy. To find out more about this class and to register, CLICK HERE. July is halfway over! Can you believe it? 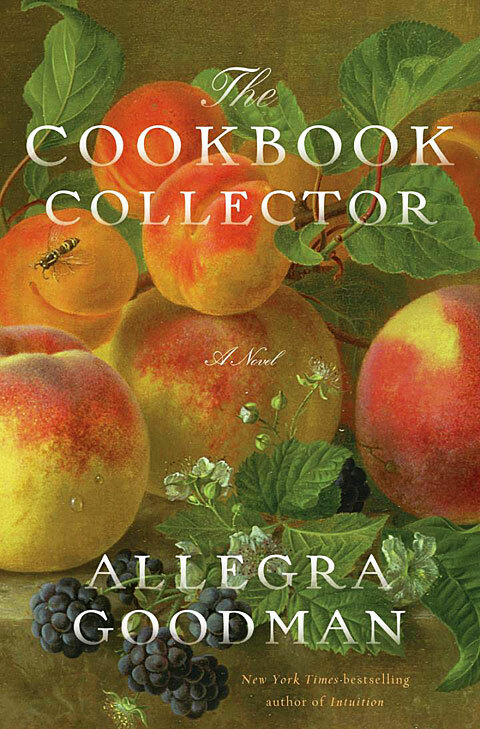 If you're participating in the Inspired by Reading Book Club, this is a little reminder that our July selection is, "The Cookbook Collector" by Allegra Goodman. The in-person meet-up is Tuesday, July 30th from 6PM to 9PM at Allegory Gallery. The Reveal for the online blog hop is Wednesday, July 31st! It's a really fast and entertaining read, so I strongly encourage you to participate. To find out more about what we do, CLICK HERE to check out our Facebook group. You can also read about how the book club started and see the book list for the entire year by CLICKING HERE. William and I were fortunate enough to get tickets to the after party of the Wrecking Ball Party at the Westmoreland Museum of American Art. They have big renovation and expansion plans! To kickoff the construction and raise funds for their goals, they opened the museum to patrons to paint on the walls and punch holes in the walls with sledgehammers. 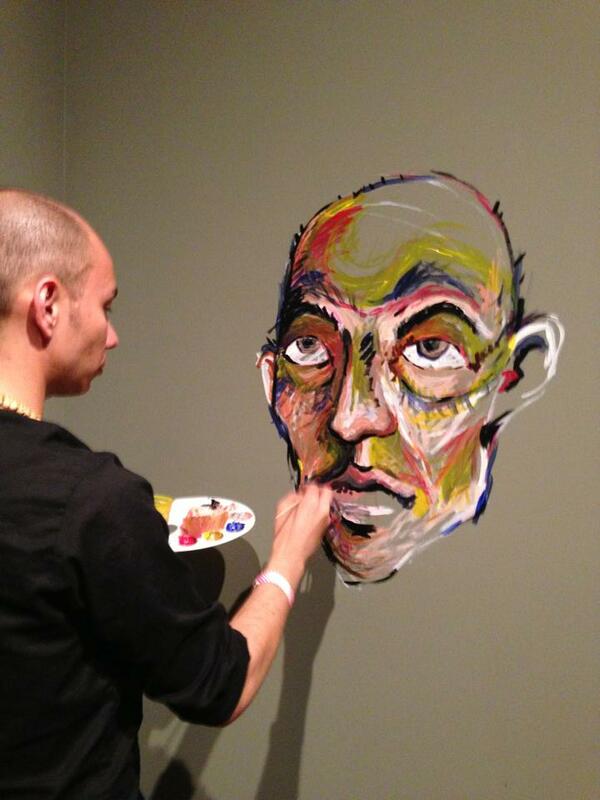 Guests could silkscreen and customize t-shirts, dance to live DJ's spinning music in a black-lit gallery, and watch graffiti artists take over portions of the museum. They had an open bar with local beers from All Saints Brewing Company, valet parking, and catering! It was quite the event and a lot of fun! William snapped this picture of me doing a self-portrait on one of the walls. (I positioned it to look at the spot where the Tiffany window used to be.) I didn't want to miss out on any of the other festivities and I knew that it would be torn down soon, so it was really quick and took me one and a half beers to paint it. When the palette ran out of paint, I moved along to the next activity. The best part was being able to talk with and interact with other art enthusiasts and creative members of the community. We touched bases with lots of friends and made some really cool connections. I love people who "speak my language". We had a wonderful time and I can't wait to see what they do next! CLICK HERE to check out the Westmoreland's Facebook page and see some of the pictures from the event! This past Saturday, we had a Square Stitch class at the Annex! We had a really good turn out! It was so nice to see a few familiar faces and a couple of new ones! It is very exciting to see the student community growing and developing. When we opened Allegory Gallery, we knew that there was never a store quite like our's in the area and that it was important to show people what to do with the beads and jewelry-components we sell. In fact, one of our main bullet points of our mission statement is to "promote artistic education". With the Annex, we're able to do that. We have more space to host events, workshops and classes! The Annex is a work in progress, but already I feel like we've made a big step forward! The next class at the Annex will be taught by Maria Richmond. She will be teaching her, "Twist of the Wrist" Class on Sunday, July 21st from 12:00 Noon to 3:00PM. CLICK HERE to find out more about the class and to sign-up online. One of the things that I love about having the brick-and-mortar shop is meeting so many really great people and creating stories together. I feel like we do more than just make jewelry or look at art, but we build creative community and encourage the artist spirit. 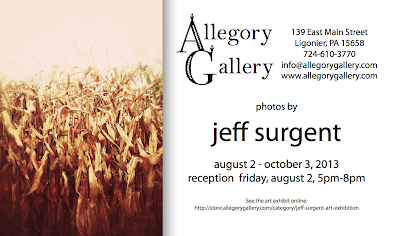 Do you have a positive story about Allegory Gallery that you'd like to share? 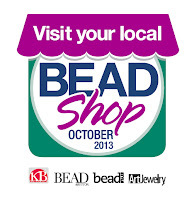 Bead and Button Magazine is dedicating a month to local bead stores! By sharing your story, it'd help get the word out about our small business and open us up to an even wider circle! So if you have a moment, CLICK HERE and share your story! To find out more about the class and to register, CLICK HERE. You can also sign up in person at the 139 East Main Street location or over the phone. For a full list of upcoming and recent classes, CLICK HERE. We had a really lovely time at this month's Open Table Tuesday. It's the second Tuesday of every month from 5PM to 8PM at Allegory Gallery. We really have a good time! I really enjoy making things in a group environment. There's so much positive energy going around! Someone asked me recently, "What's destashing?" I told her that as you grow as an artist, you develop a stash and "destashing" is the process of thinning the herd. My phone battery had died and I didn't know it. I carried the inert thing in my pocket and went for a walk. It wouldn't have done me much good even if it were charged – the cell phone reception cuts in and out along the road that leads to our house. I had managed to carve a little time away from the store and was guiltily playing hooky from the piles of work stacked on the kitchen counter... the floor... even the bed. It was good to get away, even if just for a little bit. I have batteries... other than my phone's... that need recharging too. As I walked, I went over the things that I was not doing that I should be doing. At several points, I thought about turning back. Even though there was no set destination, my body knew that it wasn't finished putting one foot in front of the other. My mind was another story. "Maybe if I go back now, I'll be able to squeeze in another hour of daylight. There are photos that need to be taken, there's shelves that need to be painted, there's dinner to be made..."
The grade of the road steepened and soon I was out of breath and the thoughts went from all the things I should be doing... that I could be doing... to the task of merely getting to the top of the hill. I've become woefully out of shape since moving to the country. I drive everywhere. I took for granted that there was so much physical activity interwoven with city living. The five-flight walk-up was an unavoidable task. Walking to the subway station was necessary. Carrying bags of groceries for several blocks was a daily ritual. I was stronger and more toned because I had to be. It brought to mind something else that I used to do more regularly... blog. Blogging, believe it or not, has been such an influential part of my own story. An example would be that I would push myself to do more things to make my blog more interesting. I would go to the obscure art opening or poetry reading, because I wanted to seem exciting and in touch with what was going on. It forced me to be in the moment, capturing images and ideas of the every day. When I first started my blogging adventures, no one hardly did it. In fact, I kept it to myself mostly. In the early days things were different. It wasn't even called "blogging" then. It was before SEO and helpful books about how gain a following and the best way to network. It was before people printed their blog addresses on business cards and had web seminars on creating meaningful experience in the digital world. It was a private, yet very public, place for me to emote and give voice to my thoughts and feelings. I was searching for my voice and my identity. I didn't know it at the time, but I was trying to puzzle out who I was.... who I am... who I will become. In July of 2006, I started this blog. Can you believe it has been almost seven years? I have posted approximately 2,882 posts. (I say "approximately" because over the years I have done some weeding and deleting of posts.) I've chronicled my personal ups and downs, blog hopped, done giveaways galore, and shared my life and aspirations as an artist. In that time period I have found a partner, had cancer, reconnected with a long-lost sibling, given up city life and opened a store. I have had two cats, four digital cameras, three computers, one iPad, and lots and lots of coffee. Through my blog I have experienced the best and worst of human behavior. I have met so many beautiful people who have challenged and engaged my mind and my heart. These seven years have been full. I stood at the top of hill, watching the sun slip behind clouds and eventually dip below the horizon. As I walked back, in the fading light, a chorus of insects and amphibians rose. Fireflies signaled to one another in the tall grass and leafy trees. My phone was dead and rested in a rustling cradle of keys, lint and yesterday's receipts... and I didn't know and most of all, I didn't care. The wooden steps creaked as I climbed them to my home. Sweat trickled down my brow, my legs ached, and I was blissfully tired. I stood a little longer on the deck, not wanting to go back inside. Even though it was not completely dark, the stars had come out. My walk was over. Here's a candid shot of Maria Richmond's class this past Saturday at the Annex! I was fortunate enough to get away from the store to take her Buttoned Up Pendant class. I had a wonderful time and really enjoyed the class. Maria is such a thorough, knowledgeable and humble teacher. Here's what all the students made! Aren't they all nice! I think they turned out awesome! If you're asking yourself, "What's that pair of earrings doing in there?" Maria also taught the Brio Scribbles Earrings class earlier that day. I didn't get a chance to take a picture of everyone's earrings from the morning session, but borrowed a pair that Julie made to make a cameo in this shot. After class, a group of us went to Mountain Palace. Over dumplings and jasmine tea, we penciled in two more classes that Maria will be teaching! On Sunday, July 21st, she'll be teaching her Twist of the Wrist Class and on Sunday, August 11th, she'll be teaching her Resistance is Futile Class. 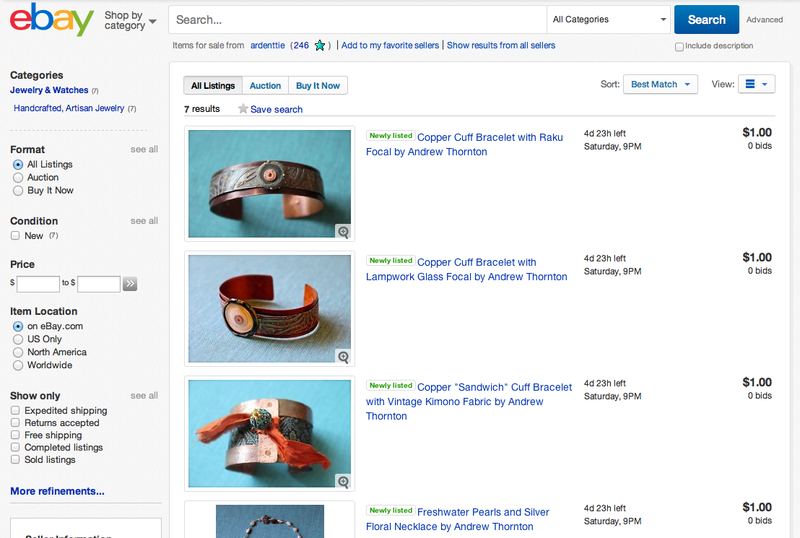 If you're interested in taking these either of these classes, you can sign up in-person at Allegory Gallery or online. (But don't delay, I have a feeling that these classes will fill up fast!) CLICK HERE to see the other classes that we're offering. Terri Greenwalt came to town for a few classes this past Saturday. We took the opportunity between classes to snap a few pictures of the projects that she made for the May selection of the Inspired by Reading Book Club, "A Rumor of Gems" by Ellen Steiber. Aren't they adorable? I love the character she's given her pieces and how expressive they are. They've got such life and they were exactly the scale I imagined the jade dragon from the book to be. Terri really did an excellent job, drawing so many references from the book and transforming them into little works of art. "I’m not a person who would normally pick up a fantasy novel, unless it was written by J.K. Rowling, since I’m a Potter fan. But Andrew did a great job in selecting this fantasy for the Book Club, because it’s filled with so much gem lore. Also, while it was obvious that Lucinda was the heroine, figuring out who among the enchanted folk was the hero really kept me guessing! Early on I knew I somehow wanted to use gems in my project, gems associated with Lucinda or Alasdair, most probably the life stones. And the jade dragon was a whimsical character which really caught my fancy, so I played around with ideas involving him, too. 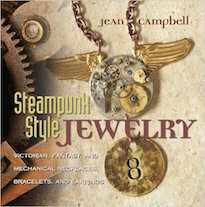 I didn’t necessarily want to make jewelry, so I thought more along the lines of an object d’art. I’m not a carver, so I couldn’t carve jade, but I have become interested in polymer clay, so I explored making faux jade for a sculpted dragon. My resources were a faux jade tutorial by Linda Moseley, which I purchased from her shop on Etsy. The best known polymer figure artist I know of is Christi Friesen, and I knew her dragon book from her sculpture series would be just the ticket so I ordered that, too. But I still wanted to use the life stones, so pivotal in the story, especially since the dragon liked to take them from Alasdair. That dragon was always up to something! But how does one incorporate ten gemstones into a project, how does one mount them, and, perhaps the larger problem, how does one afford them? So, I focused on how to procure the stones, thinking that if I could reasonably source them, I could also figure out how to use them in my art piece. My chiropractor is into the healing power of gemstones. In fact, some are available for purchase in her office. Scored some inexpensive crystal, aventurine, and moonstone. My bead stash yielded coral, turquoise, and lapis lazuli. Six out of ten, not bad at all! But those last four had me puzzled as to how I could afford stones that would be visible to the human eye. And the answer was fantasy! I would source some lab created stones for stand-ins! And I did. I went for a variety of shapes and sizes, sizes as large as I felt were reasonably priced for my project. My last dilemma was how to showcase them in my piece. They needed a container, a container that they could be attached to in some way. Thinking about all of the times Lucinda and Alasdair had tea or coffee together or alone throughout the story, as well as Alasdair’s fondness for coffee, the perfect vessel popped into my mind. The playful little dragon would be spilling a brown tea/coffee like beverage from a cup! And the liquid would be tinted resin which would secure the gems! So the search was on for an appropriate and affordable tea cup, the more symbolic to the story the better. A lilac motif would fit the story beautifully as a reminder of the lilacs that grow on the mountain of the lost city. Everything on Etsy was too expensive, but I did score a lilac covered cup and saucer at Pat Catan’s for only $4! The big project was ON! I was so pleased at the end of the novel when Alasdair turned out to be the hero and Lucinda was gifted his life stones by the jade dragon. Without knowing it before I finished the book, my project was turning out to be a perfect representation of the story! I misread the directions for the light green jade I wanted to make, and ended up having to make a huge batch of the white jade recipe to have the right proportion to go with the Burma jade recipe I doubled by mistake. It turned out to be a happy accident, because when my first light green jade dragon slouched, crashed, and declawed himself in the oven late Sunday night, I had some left over Burma jade to make a second dragon. If I had needed to make another batch of faux jade that late on Sunday night, I think my project would have just been a spilled cup of gem juice! So late at night, I made a smaller Burma jade dragon from things I had on hand, waiting patiently while he cured in the oven. The only problem he encountered in the firey cave was a crispy, burned crest, which I rehabilitated with some gold paint. More embellishment for my gem encrusted jade dragon!" The July selection for the Inspired by Reading Book Club is, "The Cookbook Collector" by Allegra Goodman. If you're interested in what the full list is for the entire year and how you can participate, CLICK HERE. The Reveal for "The Cookbook Collector" is Wednesday, July 31st! If you're interested in keeping up with what we're doing, CLICK HERE to visit our Facebook group page. We've enjoyed hearing the stories people have come up with about the pieces in Diane Hawkey's new show, "Spirits of the Earth Tribe", that we wanted to make it official! We're hosting a writing contest in conjunction with the art exhibition. Check out the flier for more details and CLICK HERE to see the show online.